I do this pole drill, using six poles in a pole pattern, with every one of my horses. It doesn’t matter if it’s an older horse or a younger horse I’m just starting, I always go to this drill. That way I’m not just loping circles, which can get monotonous for the rider and the horse. I use these poles a lot. If you’ve got a horse shouldering in, or getting a little heavy on the inside rein, this drill makes them work to go back and forth, left to right, which encourages them to listen to me and my cues at all times. It’s not the traditional pole bending pattern, so you won’t be able to go out and compete on poles just from this drill, but your horse will work better for you overall. I always outfit my horses in split reins for training. If I have a young horse, I may use a ring snaffle or a shortshanked, little gag bit. Martingales are great aids—they can do some of the work for you. If I’m on an older horse, depending on what the horse needs at the time, I may put a lifter bit of some sort on the horse, because it’s actually more bit than what I typically run in, so it’ll lighten the horse’s mouth but not in a harsh way. I do this drill three or four days a week, particularly with a brand-new 2- or 3-year-old. My poles are set up in a big, wide-open, plowed arena. So if my horses do well, we may never see a barrel that day. We may go ride in the pasture after that for 15 minutes. It gives them a chance to ride out—forward and toward a destination. Doing this in open spaces allows a horse to get comfortable with foot placement. It gives them a mental and physical break, especially right after a couple barrel races. sure my horse is soft in the rib cage and mouth, framed up and correct in their form around the poles. On an older horse, this is simply an exercise drill. It loosens them up, and you can do whatever you want after that. I rarely do it more than 10 or 15 minutes, and we’ll work on it before I go to the barrel pattern that day. Weast rewards her horses for a drill well-done by riding in the pasture on a regular basis to relax their minds and encourage them to pay attention to foot placement. If you have a horse that’s more highstrung, this drill helps. I don’t ever ride longer than 30 minutes at a time. More so than loping circles, you have an object you’re loping around. At the end of this drill, not only have you gotten your horse physically worn down a little, but you’ve also gotten it mentally prepared so it can focus. Some futurity horses I have get so physically fit that it doesn’t matter how much loping I do—it’s going to get longer and longer before they get physically worn down and not so fresh. But I need them mentally tuned down to where they listen to me. This drill allows that without being harsh. You can do this drill slowly, at a trot or a soft lope. You can do it with bigger circles, where they really have to pull with their front end and push with their rear. When you stop quickly and go the other direction, you’re encouraging your horse to really listen to you. It’s a mental game for the horses too, rather than just going around barrels all day. Dale Youree is my grandfather, and he coined this move more than 35 years ago. It encourages the horse to get off your hands and remember that you are in control. It’s the first move I’ll teach a horse when I’m training. that day. Circle in both directions. Get the horse framed up in your hands, and go to the pocket area of a barrel or pole. When you get to the pocket, stop and back up two steps, but while backing, push the horse off your inside rein using inside leg pressure. Make sure the horse knows when you put your hand down a bit, it needs to be stepping away from your hand. That way, when you do make a run and you make that hand move, it’s their cue to step away half a step or whatever is needed in the moment. I’ve found when the horse is drilled to do this stop-away, it really helps with a barrel hitter. But a lot of times, if you start your foundation with this stopaway, the horse often won’t want to hit a barrel because they know to get off your hand when you ask them. After you have done the stop-away, loop around that one pole to the left two or three times, or if you think you need to, even 10 times. Always focus on having the horse framed up. You want them in your hands, between your legs, bending their ribcage. Focus on pushing with the rear end, while the front end is pulling—essentially, 4-wheel drive. You want the horse framed up and you want to be in control of the shoulders with your hands, so if you decide to do a counter arc off the pole, you can do that at any moment before you circle the next pole going the opposite direction. Basically, you want the horse to listen to you at all times. You may want to do a small circle and then kick your horse out into a bigger circle. If you do that, use a little more inside rein and push the horse off your hand a bit with some leg pressure. Just make sure they are in your hands and still soft and supple. For a horse shouldering in a turn, this helps loosen them up. After going around the pole two or three times, move on to the next pole and prepare for a turn to the right. Do the stop away, and repeat the exercise. This is not a training drill to produce a pole-bending horse. This is a learning drill, and as long as you do it correctly and have a good start on your horse, it teaches so many fundamentals for the horse to go on and do whatever you want. 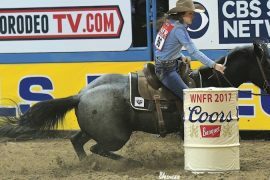 Bottom line, you’re not making just a barrel horse, you are making a better horse—in any discipline. This article was originally published in the April 2018 issue of BHN.